Last week, I posted on social media in response to Mary Mitchell’s column that followed one incarcerated Chicagoan, trapped in a cycle of mental illness, racism, poverty, and incarceration: http://www.suntimes.com/news/mitchell/28611225-452/jails-have-become-places-to-warehouse-the-mentally-ill-mitchell.html#.U8KB245OlzS. In London, I shared, if a person with mental illness has to be arrested, POLICE IMMEDIATELY CALL a non-attorney advocate plus A FREE DEFENSE ATTORNEY TO THE POLICE STATION to protect their rights so stories like this do not happen. Even the Cook County Sheriff regularly decries the misuse of the Cook County Jail, which is known for treating more people with mental illness than any facility in the nation. We are all ready for a solution. First Defense, if engaged in time, can play a key role in reversing the clinic-to-prison pipeline! Earlier this summer, I traveled to London to find out how they ‘just do it,’ i.e., deploy free advocates to the police stations to divert the mentally ill to needed treatment. Implementation in Chicago requires a program like First Defense, PLUS the participation of two departments of Chicago city government: the Chicago Police Department (CPD) and the Chicago Department of Public Health (CDPH). We can play our role. However, the CPD controls arrestees’ ability to make a call to us or even a loved one who might contact us, and CDPH controls whether their public mental health clinics will be fully resourced and accept people, including those insured through the Affordable Health Care Act middleman, County Care. The mentally ill, like everyone, already have the right to counsel and to phone calls to their attorneys “within a reasonable time” of being taken into Chicago police stations. Realizing this right is what needs to be simplified for all those with symptoms or a history of mental illness. The catch is, CPD’s standard procedure is to postpone allowing access to the phone until it’s too late— at the end of processing, after someone’s already been questioned, charged and prepped for transfer to the Cook County Jail. Currently, when First Defense is deployed, it is only because a third party calls us to report the arrest they witnessed or heard about. But people are often alone when arrested or with someone who doesn’t know, or think amid the crisis, to call us. To apply London’s successful model, the Chicago Police would need to contact us as soon as they arrest someone who may be mentally ill, or simply give them their phone calls and our number if they are lucid enough to give us: name, birthdate and location. The superintendent could codify this in CPD General Orders. We could also implement it as a pilot in one or more Areas where local police leadership is most inclined. Why not? Officers in Chicago have often told me that they don’t want the job of responding to mental health emergencies: they are law enforcement, not nurses. By letting police, instead of mentally ill arrestees, carry the burden of engaging an advocate, they can help people get the support they need to possibly be redirected to the care of medical professionals. CPD recruits now get training on responding to people in the midst of mental health crises. But even with this training, relying on police discretion has not prevented criminal charges and transfer to County Jail whenever possible. People are typically alone with police and prosecutors for days without an advocate or even access to their medicine, putting them great risk of additional criminal charges, waivers of rights, and even physical, sexual and emotional violence all due to their illness. Further, repeated misdemeanors can be upgraded to felonies, a scenario the mentally ill are particularly at risk of, even at the admission of the Office of the Cook County State’s Attorney. London-area police I met with understood that jailing someone with anxiety, post traumatic stress disorder, paranoia and depression only exacerbates disease and in the end is counter to public safety interests. Engaging advocates early, police said, prevents the worst from happening. First Defense’s experience providing station house defense over the past 19 years echoes that. In addition to aiding the early diversion of cases to treatment and circumventing criminal charges and jail stays, lawyers at the police station can prevent long jail stays even for those who cannot be diverted immediately from the station. Only defense counsel AT THE STATION can: advocate access to prescription medicine or other emergency healthcare; document evidence of the client’s invocation, understanding of their rights and ability to waive them; gather information for use in bond court, preliminary hearings, pre-trial motions, and trial; and note patterns to inform further systemic reforms. A third agency’s participation is crucial for an adapted ‘London model’ to succeed in Chicago: the Department of Public Health needs to accept referrals in order for people to successfully find care instead of the criminal system. Here is a video produced by those at risk, explaining the interplay between recent service cuts and arrests: https://www.youtube.com/watch?v=06sRODKK5cY. 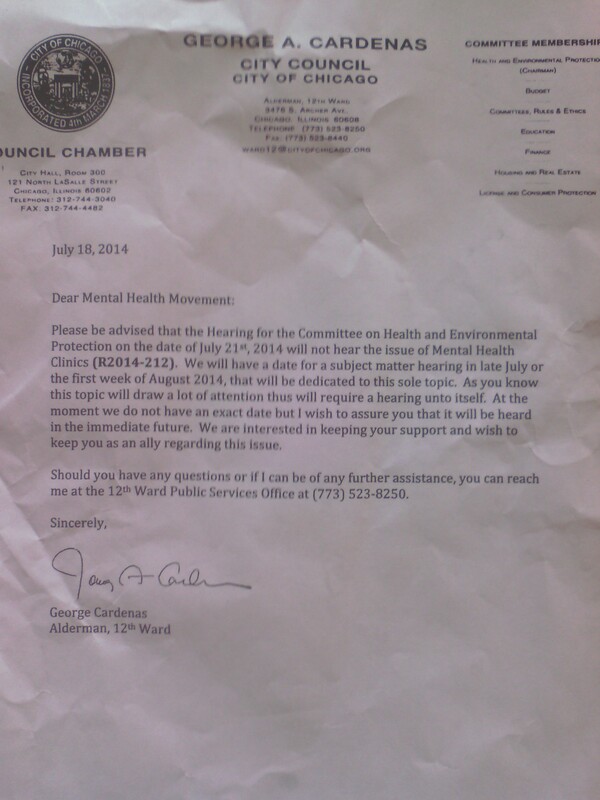 The January 2012 video was released before half of the city’s 12 mental health clinics were closed that spring. That April, dozens of Mental Health Movement patient leaders and caregivers conducted a peaceful sit-in in the Woodlawn Clinic and were arrested by CPD SWAT teams. Photo credit: Sarah Ji. Pictured: Darrius Lightfoot speaks out at a vigil at Cook County Jail that I went to with the Mental Health Movement co-sponsored by Dart, calling for reinvestment in City clinics, accepting County Care payments as a start, and a hearing on the state of mental health services in the city. The greatly anticipated hearing on Chicago public mental healthcare will be scheduled in City Counsel Chambers this month. I plan to be there and available to testify. We are ready to play our part to stop the cycle of poverty, mental illness and incarceration, and ask the City to do what it can. If the police will give mentally ill arrestees access to the phone and our number, First Defense will provide what is already a right: a lawyer in the police station. If CDPH will join the County Care network, invest in public mental health clinics and accept our referrals, many mentally ill people can be diverted from the police station to treatment and never see the inside of Cook County Jail again. By eliza1800lawrep4In Uncategorized, You've Got That Right!